A frying pan with a decorated handle to be held over the fire. The handle is ornamented with three beads, which resemble pearls. 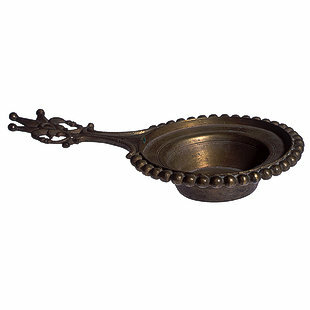 The pan is somewhat conical in shape and is decorated with a ring of pearls round its edge. The bronze was forged by being heated and hammered into the required shape. This frying pan can be considered to have been used for domestic purposes.